Mylife is a malicious, destructive worm that deletes important system files. The original and its later variants displayed pictures and from this it became known by some other (not as often used) names, including Caricature (or some shortened form of that word) and the Bill Clinton worm (variant B only). The icons it used were also interesting. When it is executed, the worm copies itself to the system folder as the same name as the attachment. The worm adds itself to the current user run registry key It displays a picture of a woman dressed in antique fancy clothes holding a flower. The worm mails itself to all addresses in the Windows address book. It checks if a variable is equal to or greater than 45 and if so begins deleting certain files. The worm deletes all .sys and .com files in the C:\ root folder, all .com, .sys, .ini, and .exe in the Windows folder and .sys, .vxd, .exe, and .dll files in the System folder. When the attachment is executed, Mylife.B displays a caricature of former US President Bill Clinton. This variant's payload triggers when CARI.SCR is in the system directory and the hour value is equal to 8. In addition to all addresses in the address book, it gets email adresses from the MSN Messenger database. Mylife.B deletes .sys files in the Windows directory and .vxd, .sys, .ocx, and .nls files in the system directory and all files in the root directories of drives C:, D:, E:, and F:. These three variants are not particularly remarkable, aside from the fact that they display a caricature of then-Israeli president Ariel Sharon as a bull. 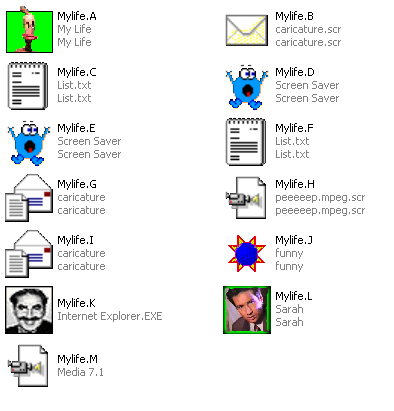 Mylife.G overwrites MP3 files with the text "my lIfE". When Mylife.M is executed, it creates a file named MyLife.mpg in the root directory of the C: drive and tries to run the Windows media player. It creates two copies of itself in the system directory named "Julia_Roberts_F*cking_toilet.Mpeg_.scr" and "Shakira_1997_part_1_.Mpeg_.scr". It adds one of these files as a value to the local machine Run registry key. It deletes all files on the D:, E: and F: drives and all .sys files in the Windows directory. A Central Command product manager said mostly home users were affected. With both the original and the variants, many antivirus researchers had difficulty getting the payload to run on their test systems.